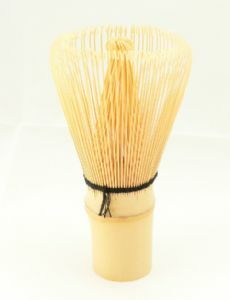 These bamboo whisks or 'Chasen' are a work of art! Designed specifically for Matcha tea they feature approximately 100 ultra thin 'bristles' for maximum frothing when whisked. With practise and using a brisk back and forth motion with the wrist they soon whip up a frothy head on Matcha tea. They are pretty hardy but should be washed with cool water and air dried.